Badulla – Chandra Jayarathne- Women’s Development Center. 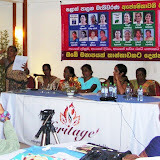 Our organization was established in 1995.Ever since then we guide village women in Badulla district to build up their socio-economy and political status. Whilst building the community, we also work on protecting human rights and making friendly environment to society .We are mainly focusing to develop women with low income and rural estate community. We have conducted various programs together with Governmental and Non governmental organizations in district basis ranging from Training programs, Women and financial planning programs, We also have taken part in election monitoring as well have provided training for women on vocations.